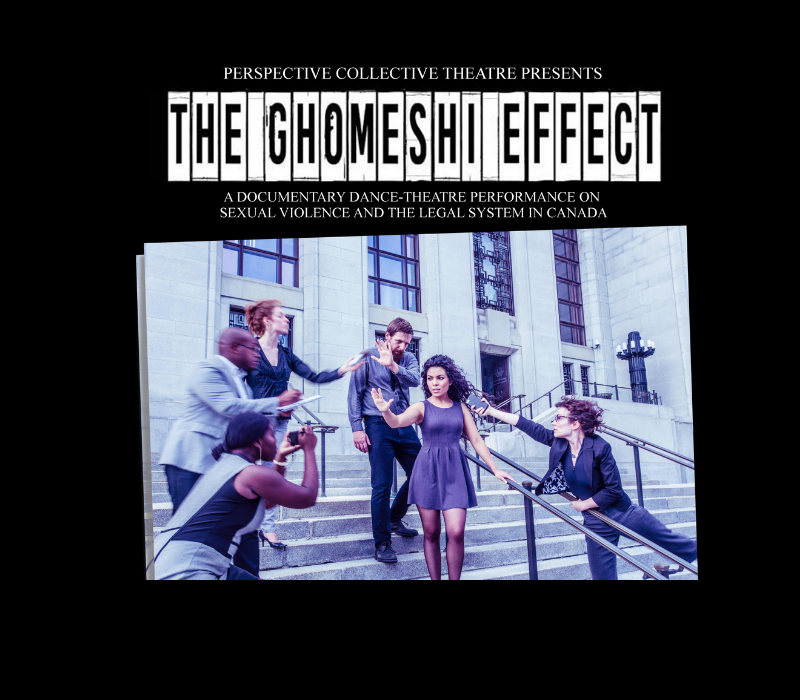 Red Deer, Alberta (October 23, 2018) – With sexual violence dominating the news cycle and social media feeds, Ottawa’s award-winning documentary dance-theatre performance The Ghomeshi Effect offers a nuanced exploration of how the legal system handles sexual assault cases in Canada. Following a limited run at the University of Ottawa’s LabO Theatre from October 23 to 27, the play will tour universities and communities in Ontario and Alberta, including London, Sudbury, North Bay, Cochrane and Area, Calgary, Medicine Hat, Red Deer, Edmonton and Fort McMurray. All performances are followed by a talkback with expert panellists from each community. Dates and venues listed below. The Ghomeshi Effect will be presented in Red Deer by the Central Alberta Sexual Assault Support Centre (CASASC) on Friday, November 9 at the Red Deer Memorial Centre. The performance begins at 7:30 p.m. and tickets are per person. In the aftermath of #MeToo and #TimesUp, The Ghomeshi Effect shares real-life stories of survivors alongside interviews with lawyers, academics, and support workers, and offers new perspectives and opportunities for open discussion through words and movement. CASASC Executive Director Patricia Arango says the not-for-profit is thrilled to bring the impactful production to the central Alberta region. The Ghomeshi Effect tackles sexual violence in Canada, particularly how it is handled in the legal system, through an edited series of documented interviews, and uses dance to inform and interrogate the language used in the discussion of sexual violence. Written and directed by Jessica Ruano (2017 Femmy Award Winner) and choreographed by Amelia Griffin, this production features performers Nayeli Abrego, Leah Archambault, Elizabeth Emond-Stevenson, Gabrielle Lalonde, Joy Mwandemange, Emmanuel Simon, and Michael Swatton, as well as the work of lighting designer Benoi?t Brunet-Poirier and sound designer Martin Dawagne. The Ghomeshi Effect was originally presented as part of The Gladstone’s 2016-17 Season and played at the Shenkman Arts Centre. Since then, members of the team have presented at the LEAF Gala in Toronto, International Women’s Day Ottawa, and Take Back the Night – Lanark County. The Ghomeshi Effect acknowledges funding support from the Ontario Arts Council, an agency of the Government of Ontario, and the Alberta Status of Women. CASASC is a voluntary, non-profit organization serving the Central Alberta region under the direction of a community-based Board of Directors. CASASC educates, supports and empowers individuals, families and communities regarding all aspects of sexual abuse and sexual assault. Tickets are $5 and are available through The Black Knight Ticket Centre (in person or online at https://tickets.blackknightinn.ca) or at the Central Alberta Sexual Assault Support Centre (A201, 5212 48 St, Red Deer, AB). High school students receive complimentary entrance with a valid high school id at the door. Hundreds of Central Albertans work for one of Canada’s safest employers!